For Thierry Michon, the gregarious force behind one of the Loire's best-kept secrets, Domaine Saint Nicolas, it's all about the soil. Working on schist and silex a stone's throw away from the Atlantic, Thierry is the prophet of biodynamics in this tiny viticultural area. His vineyards never see a non-organic product. He has slowly purchased buffer zones all around his property to prevent chemical products from other winemakers from seeping into his parcels. For him, biodynamics isn't a pragmatic consideration, it's a religion. Domaine Saint Nicolas sits at the extreme southern end of the Loire delta, just south of Muscadet, but there is no Melon de Bourgogne planted here. Instead, Thierry works old vines of Chenin Blanc, Chardonnay, Groslot, Pinot Noir, Negrette, and Cabernet Franc. If you think working 40 hectares biodynamically (certified by Biodyvin) is easy, you're crazy. Working by horse and tractor, Thierry usually answers his cell phone from the vineyard, often as late as 10:00 at night. You will not find a more dedicated vigneron in France. Harvest is, of course, by hand. The whites pass through a sorting table and are then gently pressed and allowed to ferment in large wooden tanks. The reds are sorted and then crushed by foot in foudre. The whites and rosés are released as early as March of the year after harvest while many of the reds are aged for up to 18 months. One of the few in the area to age in barrel, Thierry's years of hard work are starting to pay off. For years he worked all week in the vines and then took off on Friday afternoons for the 5 hour drive to Paris. From the back of his truck he sold his wines to restaurants and small shops. When the wines starting showing up on the lists of Guy Savoy, Taillevent, and Arpège, people starting paying attention. 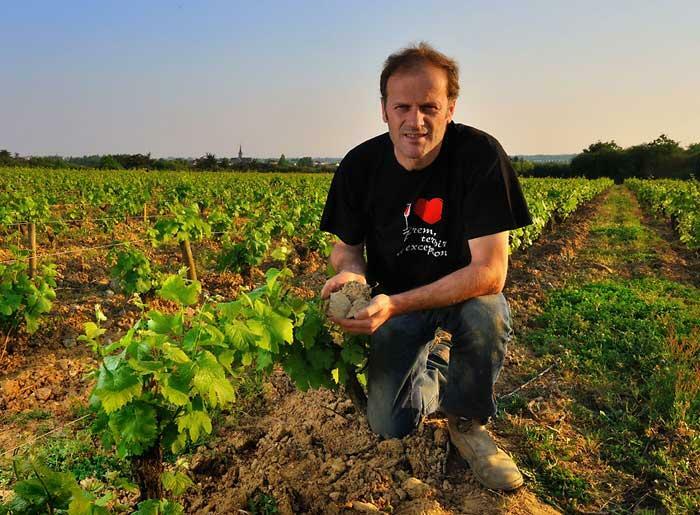 Now he is a leader of the biodynamics movement in France, the defender of his little appellation, and one of France's most respected winemakers. These are soulful wines of amazing purity.